Hourly rates are a service model that has been employed in law firms and other professional services for decades. But in recent years, law firm clients have caught on. They don’t want to pay for an hour. They want to pay for a service, and as a result law firms have started figuring out ways to provide alternatives to the almighty hourly rate. Why do I tell you this? Because just as law firm clients don’t want to pay for an hour of someone’s time, neither do your clients. Price per hour is the most common way service providers start out pricing themselves. It is a very straightforward math calculation of hours worked times rate equals payment. Everybody gets how it works. In fact, it’s how I priced myself when I first started Fiscal Fitness. While an hourly rate is the easiest way for service providers to price themselves, it creates problems and challenges of its own for a few reasons. No one wants to pay for just an hour of your time. An hour of your time means nothing to your client. How do they know what an hour of your day looks like? How much can they expect you’ll accomplish in that hour? And chances are they will need more than an hour of your time for whatever thing they ultimately want to accomplish. How are they going to know how many more of your hours they will need? If they don’t know how many of your hours they need, they cannot budget for the amount they expect to spend. It’s an unknown cost. The real value is the problem you can solve for them, not the amount of time you spend on their problem. If a client pays for an hour of your time but you’re able to solve their problem in 15 minutes, the real value is that the problem got solved – not how long you spent solving it. Price per hour also leads to comparisons. If your rate is $100/hour, what is going to stop them from looking for someone who bills $99 an hour instead? It quickly becomes a race to the bottom on pricing, and that is not a race you want to win. Your clients also may end up comparing your hourly rate to their own. If they only make $50 an hour, they’ll need to work two hours to meet with you and may start to question if one hour of your time is worth two hours of theirs. What is a service-based professional to do? Why? When you base your prices on the value you provide, your clients will start to see your services as invaluable. By demonstrating your value, it becomes less about hiring you by the hour and more about what can be accomplished in your time together. Clients will never inquire about your hourly rate because they are not paying for your time. They are paying for the results you will get them. And luckily, as a financial coach, your services can and will have a positive effect on their life immediately, not to mention for years to come. I have a four-month-long coaching program. That program comes with a fixed price. I know what results I can achieve with my clients after four months. And I know roughly how much time it takes on their part and mine during that time to accomplish everything I want them to accomplish. Let’s say that the service costs $4,000. While it would be easy to say it’s a grand a month for that program, it still doesn’t provide any value when you look at each individual month. It’s the summary of our time together that has value – not an individual session or hour. When I frame this $4,000 service by saying in four months you will see your money clearly, feel confident in the choices you make each day and be able to implement a plan to pay off your student loans in six months, that has a value that feels different than $1,000 a month. Monthly pricing also causes issues, especially if you have more than one coaching program. I have a 12-month coaching program. If that program costs $6,000, there would a perceived value that the 12-month program is better than my four-month program. It’s only $500 a month for that program and the client gets to work with me longer. But what if everything the client wants to accomplish can be achieved in four months? Sure, the price per month is less, but if they don’t need the extra eight months of coaching, why pay an extra $2,000? This is why you’ll never see the prices for my coaching programs on my website. So just how do you figure out your value? It’s a valuable exercise (pun intended) and what we will go over next. 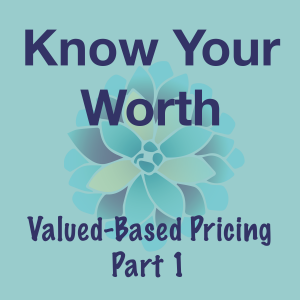 Stay tuned for part two where we’ll talk about How to Determine Your Value and part three where I’ll discuss how to revolve your sales pitch around your value. In the meantime, head on over to the Financial Coaches Unite Facebook page for more inspiration and tips for creating and sustaining a successful financial coaching business.